If you’re in the market for security, thermal efficiency and versatility then look no further than Albion aluminium doors. We work with homeowners in Croydon, Bromley and beyond. Albion aluminium doors are crafted from one of the most structurally secure materials on the planet. Aluminium has been used in buildings across the world for generations thanks to the innate weather-proofing and durability that these products provide. They are also remarkably easy to customise, with simple frames that can be powder-coated swiftly and efficiently. Other characteristics of modern aluminium doors include low U-values, high thermal efficiency, surprisingly lightweight materials and a customisable framework. With two incredible profiles to choose from you’ll be spoilt for choice. Both offer their own features and benefits, and you can find out more information about each of them by scrolling down below. The Centurion range of aluminium doors is composed of some of the finest aluminium materials available to date. Constructed in a state-of-the-art manufacturing facility, this incredible selection of the best aluminium around provides any home with bolstered security prospects, excellent thermal efficiency and a durable profile. If you’re in the market for a premium product then reach out to our team today to find out more. These doors come in an incredible variety of 87 distinct designs, meaning that you’ll easily find a design that suits you whether you live in a traditional home or a more modern property. Scroll through our list of door designs below to get a taster for the quality we can offer, or visit our Bromley showroom to see a selection of our products in person. Below however, we have all 87 designs available for you to see, including their name so that you can bring that to our specialists when the time comes to start your project. Versatile by design and styled to suit both modern and contemporary properties, our Real aluminium doors are our second range of aluminium doors and are tailor-made for you. With a maximum height of 2400mm, size isn’t a problem, and we offer easily adjustable thresholds for an accessible product. With additional triple glazing you can even reach U-values as low as 1.6 W/m2K for an energy efficient property. Aluminium is also an incredibly durable material, and our Real range are PAS 24: 2012 certified as well as BS 6375 Part 1 weather-resistant. When combined with intricate shootbolt locking mechanisms and heavy-duty windowpanes, you can experience an excellent strength-to-weight ratio. Customise your aluminium doors today and find the product that’s right for you! We are a market-leading installer of double glazing, with experience working with the finest aluminium doors profiles. Our devotion to high quality practices has led to our recognition with accrediting bodies such as FENSA and the Which? Trusted Trader scheme. These monitoring groups regularly assess home improvement specialists to ascertain they surpass all industry standards. This recognition is well-earned and stems from our many years of working with the finest installation teams in the business. Every one of our field agents combines relevant qualifications with hands-on experience in order to provide you with the best possible service. The result? Swift and efficient installations in each and every project. 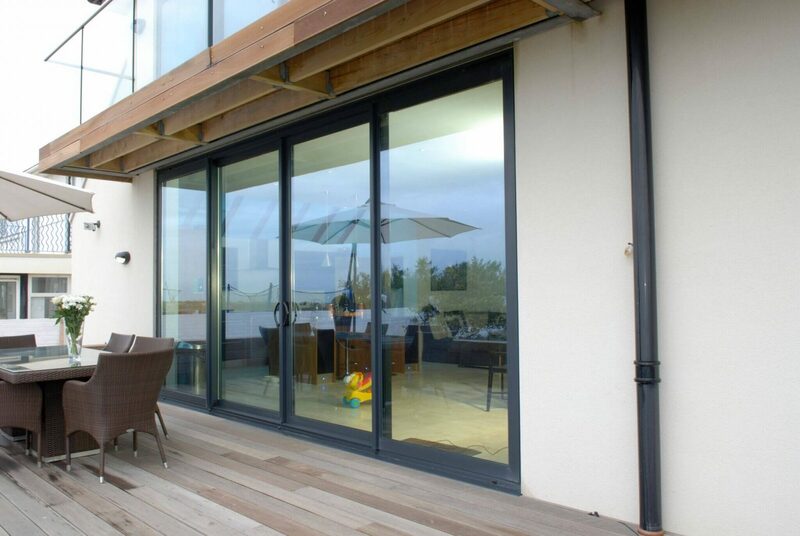 If you think that Albion aluminium doors sound like the perfect choice for your home, then don’t hesitate to reach out to our specialists today. We have many years’ experience within the home improvement industry, so give us a call on 02084 622 201 to get your project started. We’re always on hand to answer your questions, and we implore you to utilise our subject knowledge. You can also fill out our online contact form in order to submit a request to us in writing. We make sure to respond to all such queries in a quick and timely manner. If you would prefer to simply get a bespoke quotation however, then head over to our online quotation engine. This simple tool just needs a few specific details, at which point it will generate a personalised, no-obligation price.